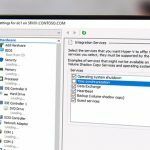 All member servers and workstations synchronize their time with the nearest domain controller. Tip. 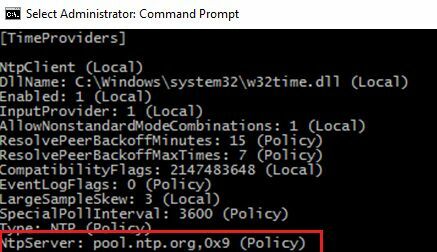 For more information about configuring NTP time in a domain, see the article Configure NTP Time Sync using Group Policy. For example, this is how the time settings look on our virtual domain controller. As you can see, it uses group policies to configure time setting and synchronize time with the external source pool.ntp.org. However, if you check the current time source (w32tm /query /source), you can find it unexpectedly, because you can see a strange time source named VM IC Time Synchronization Provider. The fact is that Hyper-V virtual machines synchronize their time with the host by default, and regardless of the settings of the time service inside the machine. As a result, it can turn out to be a rather strange situation when the Hyper-V host is a member of the domain and synchronizes time with the domain controller, which in turn is a virtual machine and synchronized with the host (Recursion?). In order to avoid this, you must disable time synchronization with the host for virtual domain controllers. There are two ways to do this. The first way is to disable time synchronization in VM properties. 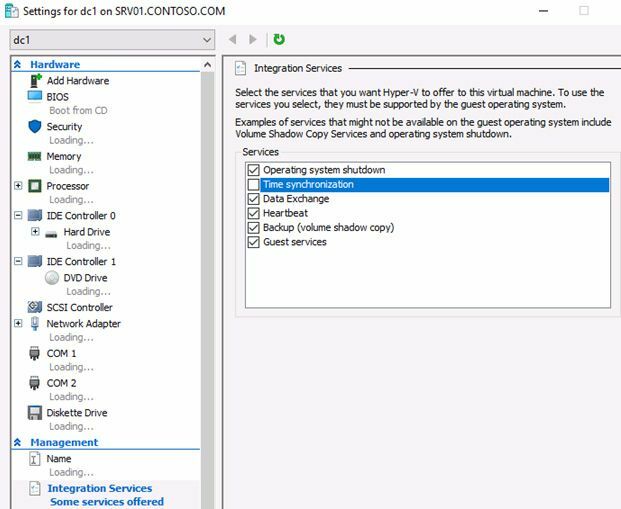 To do this, open the properties of the virtual machine in the Hyper-V Manager snap-in, go to the Integration Services section and check off Time synchronization. 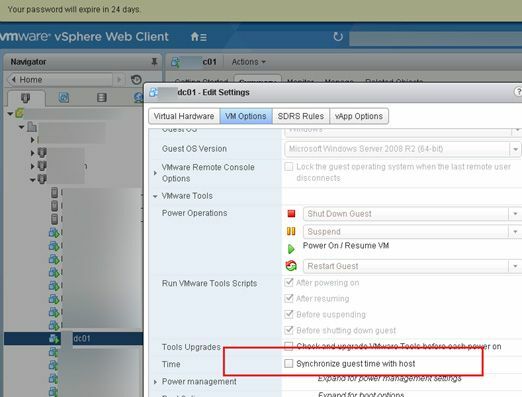 If you are using VMWare ESXi as the virtualization host, you can disable the time synchronization with the host in the virtual machine settings. VM->Edit Settings -> VM Options tab -> Check off Synchronize guest time with host. The second way is to edit the registry inside the guest virtual machine with ADDS role. 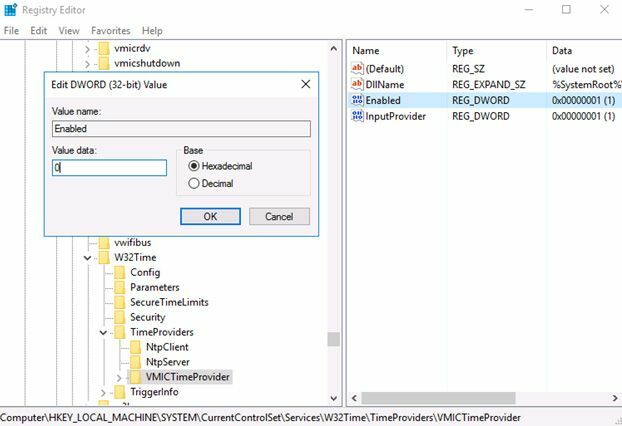 To disable synchronization, run Regedit.exe, go to branch HKLM\SYSTEM\CurrentControlSet\Services\W32Time\TimeProviders\VMICTimeProvider and change the value for the Enabled parameter to 0. This will cause the Time Service to select the PDC emulator as the source according to the domain hierarchy. In this way, we will configure the correct time synchronization scheme in the domain. So no matter what I do, including using the GPO guideline above my w32tm /query /source always says Local CMOSClock, spend my day chasing the system time always..my domain clients do show DC1 or DC2 as the timesource and the non pdc shows that he gets its from the PDC. Seems silly to be chasing this so hard for so long yet everyone knows that time is very critical. for now it had my time off by an hour behind almost exactly so checked my timezone its all good and DST is checked….so I bumped it an hour right…then later after re running all and verifying all registery settings are per above I rebooted, now time was off by an hour ahead…. I do know that VMware had additional vm options for this they say are best practice, but to be honest unless I can get this PDC to say something other than Local CMOS Clock its pointless right? Thanks, I have beeen trying to solve sync problem for at least 2 hours. Your article solved my issue. Great work!